Powerful kings and their beautiful queens, ruling huge empires, their breathtaking stories, magnificent castles that echo with the glory of their triumph, majestic lifestyle and inspiring victories, all these things always cast their spell on me. And I am sure that years back, while listening to your grandparents at your sleep time, these have enchanted you also. Today, on occasion of world tourism day, I decided to have closer look of Mewar kingdom when my friends planned a trip to Kumbhalgarh and Ranakpur. As the enchanting sights of the fort, temple and adjoining places completely soaked me, I am hereby sharing my copious memories and experience of the day with all of you, the memories of which are still fresh in my mind. 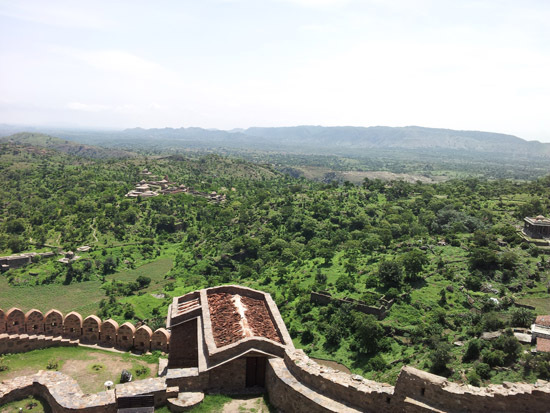 The first destination of our journey was Kumbhalgarh. Standing at the large entrance leading to the fort, I was completely mesmerized, completely fantasized. 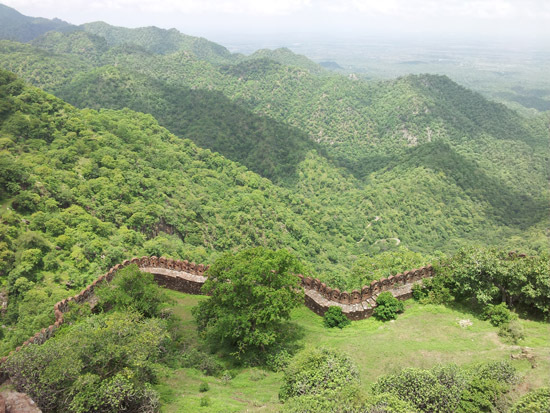 Secured against the backdrop of towering mountains of the Aravali ranges, guarded by seven massive gates, seven defending walls and with numerous watchtowers, this mountain fortress has witnessed many battles, is strong founded and so is unbeatable till date. Built on a hilltop of 1100 meters above sea level it is stated to have the second longest wall in the world, with a perimeter of about 36 km, the first being “the Great Wall of China”. 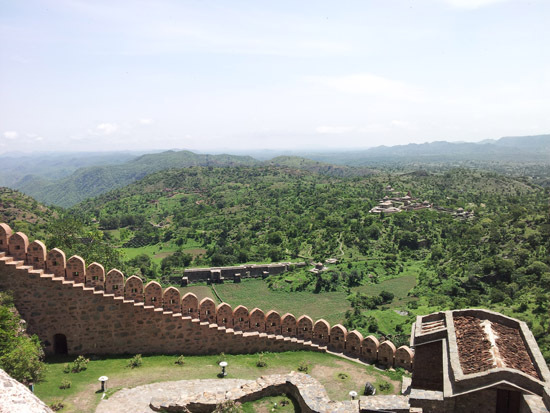 Also called Kumbhalmer, the fortress is inter-weave with the rich history of Mewar rulers. 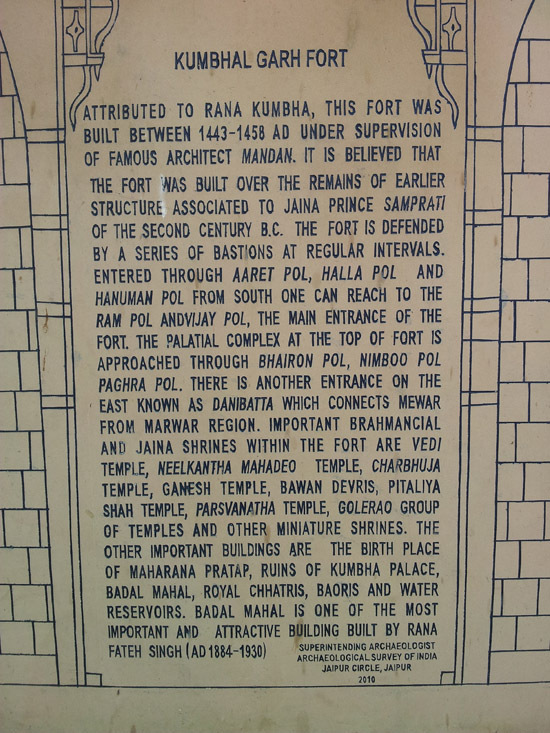 It is the birth place of Maharana Pratap, the great king and warrior of Mewar. 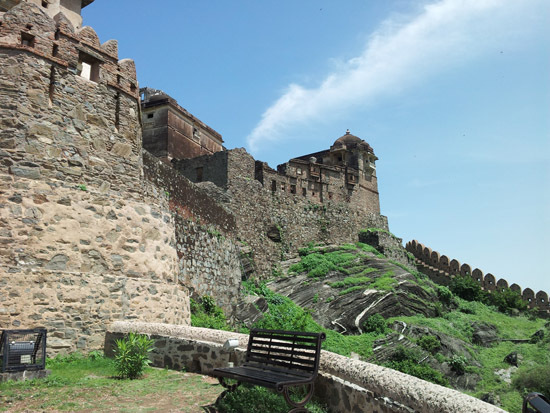 It derived its name from Maharana Khumbha who designed and built this unconquerable fort in the 15th century which was further enlarged through 19th century. The second most important and elaborated fort of Rajasthan after Chittorgarh, it was occupied by the royal family till 19th century, but now is open for general public as a museum. 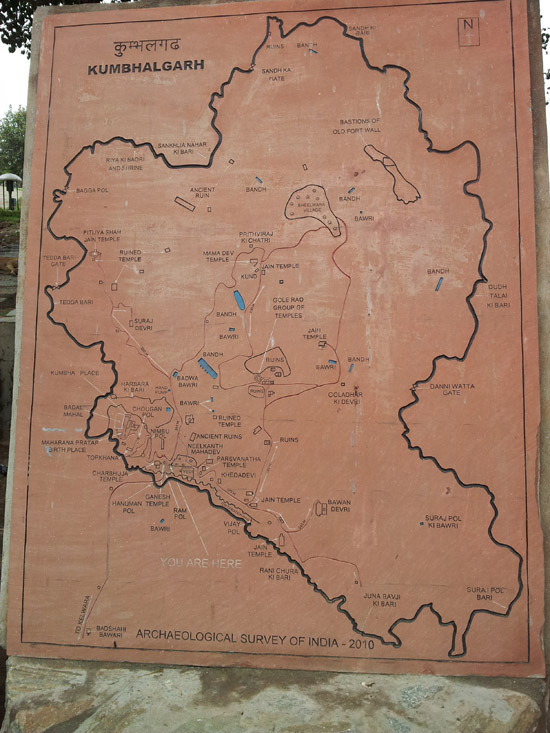 The location of Kumbhalgarh has always given an added advantage to it. Being easily accessible from Udaipur, Ajmer and Jodhpur, it highly attracts and is visited by tourists all over the globe. 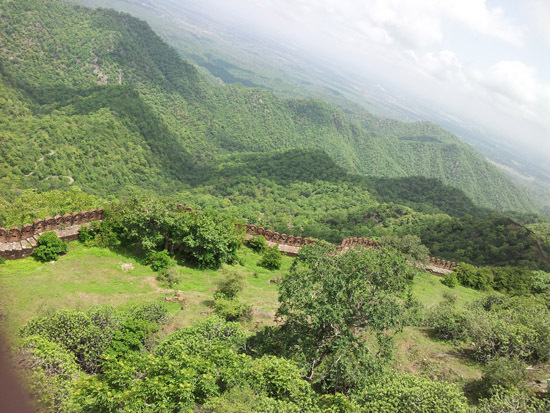 Situated in the Rajsamand district of Rajasthan, it is towards the north-west of Udaipur, 82 km by road from the city. The huge complex offering ancient remnants to explore was worth watching, comprising over 360 Jain and Hindu temples, numerous gardens and palaces, making it more beautiful and magnificent. 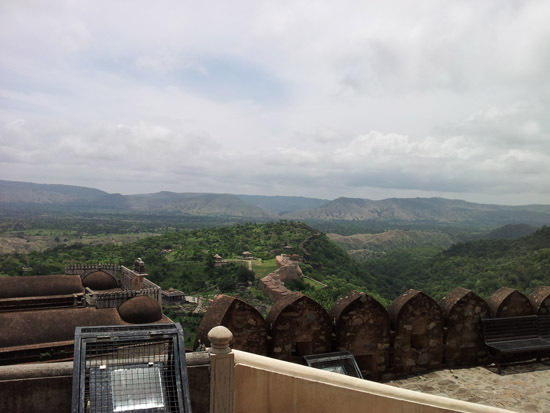 The most spectacular place of the fort resides near the clouds, “Badal Mahal”. It is the beautiful palace with fantastic bright contrasting color combinations of green, turquoise and white to the rough, raw and earthy fortress, making the view pleasant. The place, as per its name, gives the pleasure of being wandering in the world of clouds. The day was quite moderate in temperature. Sunny after a rainy season, the temperature was of the weather was comfortable. During summers, the temperature reaches up to 25-42°C and varies from shivering 2°C to maximum 22°C during winters. 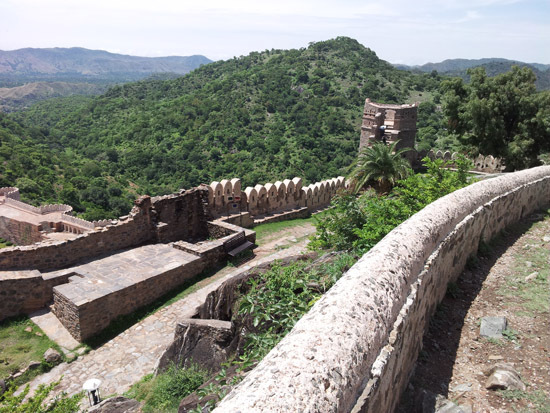 The pleasant time to visit Kumbhalgarh is between the months of September to March. During monsoon the humidity may disturb your mood. The exciting trip hasn’t completed yet. While I’m on my way to Ranakpur, and posting the article for all the UdaipurBlog readers, I will have to currently end this part and gear up for the next destination. Take a look at the pictures of the magnificent place, and I will catch up soon with the other part.